If the idea of watching and recording TV through your computer sounds appealing, read on! TV tuner cards have been around for several years and now more than ever they are very affordable. This article will explain what a TV tuner card is and how to install it. A TV tuner card enables your computer to read television signals directly from the wall outlet. There are three main types of television signals that are broadcast. These are ATSC digital cable, QAM digital cable and analog cable. In order to view them, the TV tuner card will need a tuner for each to decode the signal and bring it to your desktop for your enjoyment. Thankfully, most of the modern day TV tuner cards have the capability to decode these digital and analog signals. Some of the cards can even capture and record live television and allow you to save it to your hard disk for later viewing. This process is called video capturing. Now that we've covered the basics, lets take a look at the benefits to using a TV tuner card. There any many benefits to using a TV tuner/capture card. First, you no longer have need for a television, provided that you have a nicely sized computer monitor. This can save quite a bit of space, especially for the space-strapped college student, apartment dwellers, or those trying to free up some clutter in their houses. Another benefit to using a tuner/capture card is being able to set the card to record the TV program at a certain time, which allows you to view your favorite shows on your own schedule. You will no longer have to stay up late to enjoy your favorite show, simply set your capture card to record at the appropriate time and the program will be there waiting for you. Its that easy! 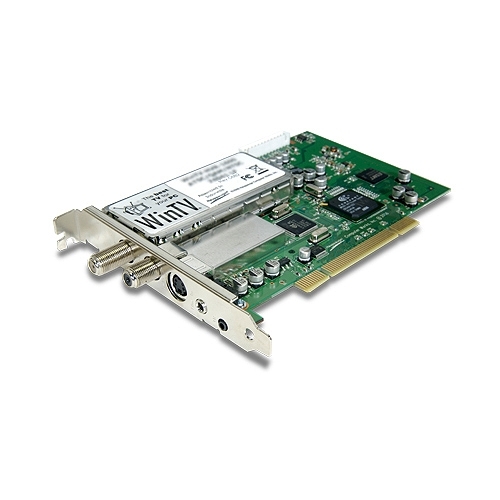 Most TV tuner/capture cards are the PCI or PCI Express interface. Before you run out and get one, you must make sure you have an available slot to accommodate the TV card in your motherboard. Installation is very similar to a network or video card and couldn’t be easier. Power down and unplug the computer and remove the side cover. Locate a vacant slot and just simply slide the card into position and secure it to the case using a Phillips screw. Return the side cover and the connections to the back of the computer and power it on. That's all there is to it! No article is complete without recommending some great products so here we go! Our top recommendation comes in the form of the Hauppauge 1199 WinTV-HVR1600 PCI Dual TV Tuner . This little powerhouse sports some great features to get you excited. As mentioned earlier, this card features a built in TV scheduler so you can set the tuner to record any show at any time you like. An IR remote is included in the package giving you the freedom to sit back, relax and channel surf at your leisure. There is no need to sit at your computer desk to change channels, just use the provided remote! If you are looking for a great tv, check out the Samsung 19" Class Slim LED HDTV . This is loaded with great features and a great price to boot. TV tuner cards are a great way to record your favorite TV shows. With the ability to view both analog and digital channels, you will no longer have need for the big clunky TV. Tuner cards are well worth the cost because in essence, you are getting a TV tuner, a video capture device and replacing your TV all in one bundle.